Camping on a Grand Canyon Tour: The Easy Way! On your Grand Canyon 4 Day Rafting and Ranch Tour, you'll experience one night at Bar 10 Ranch and 2 nights camping along the river's edge. 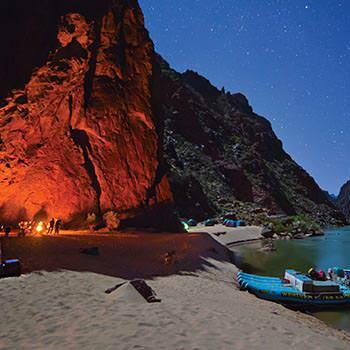 Whether on a long sandy beach or at the base of towering cliffs, Western River guests often find their time in camp to be one of the most enjoyable aspects of the trip. After a day on the river, you'll look forward to watching the sun cast its final rays across the cliffs as the first of billions of stars begin to appear. You'll look forward to awaking to the sound of the canyon wren at first light, and the smell of breakfast cooking. Camping in Grand Canyon along the river is truly an unforgettable experience. A smaller, personal day-use bag keeps important items handy during the day. A convenient place to store rain gear, sunscreen, medication, etc. Steaming French pressed coffee provides welcome warmth to counter the cool sand between your toes. You might think you're still dreaming when you see plates of steaming flapjacks, fresh fruit and scrambled eggs, but it's the way every morning on the river begins. Western's guides are not only trained river professionals, they're talented campfire cooks as well. And Western always serves fresh food on all river adventures.